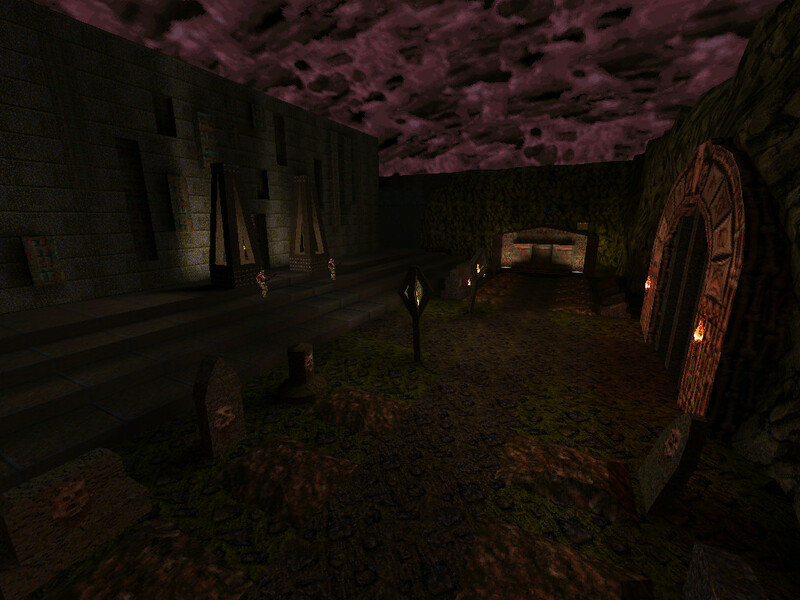 Since Spirit is even more useless than I am, this is now up on Quaketastic: Temple of Quake, a new SP and DM level by Esrael. An around medium-sized runic temple with a graveyard surrounded by rocks. It is somewhat unique in that the level can be finished fairly quickly, but in order to visit all areas and get better equipment it requires exploration and secret-hunting. This is Esrael's first attempt at mapping. Using Trenchbroom, the author went nuts on terrain which caused some problems for compiling. The original release was leaked, boxed and unvised, in addition to exceeding some stock Quake limits. Since the map map source is included as "public domain", I took the liberty of fixing the aforementioned technical problems. The rest remains unchanged. it's too easy to find the exit. And we can't get back for exploration. This map feels unfinished. In all the right ways. I like maps that encourage exploration, and this fits the bill. The biggest danger in this map I believe, are the spike shooters which did kill me several times, especially on the slow platform ride. I found only 4 secrets legitimately, the fifth I found using noclip which progresses in the second demo, but I proceed to complete it normally, until I die again. But at that point I defeated nearly every enemy. For the majority of the first demo, you might want to put it on fast forward as its a lot of me looking around for the secrets. A terrific first map Esrael, I really liked this one, and it actually encouraged me to find secrets, even though I'm terrible at it. You show great potential :D For those of you brave enough to discover all ten secrets, good luck to you, cause this ones a doozy. Zipped demo's of my playthrough on hard skill. First demo is after I died a few times (mostly from that spikeshooter trap) so I had a feel for the map already. The second demo is after I found the gold key secret and proceeded from there. Nice map, but I got the silver key, killed the shambler, and then... what? The lights goes back off, the bars are removed, but nothing else happens. I have no idea where to go now. Stuck at 11 enemies and 4 secrets. The floor on the water exit from one of the secrets isn't reachable enough, I kept swimming without the player jumping out of the water. The only spot where I managed to jump out of the water is on the wall in the back. I liked the architecture, although the texturing could be a bit improved. The encounters are also nice, with a few cool surprises. One person said finding the exit was too easy. One person said they are stuck. Oh I gotta download this now. That comment of yours made me want to try, Mankrip, and its quite good. Thanks, Negke for finding it and sharing. Even more considering its a first try. It has many parts that look like a first map but they are well executed for the most of it. It is challenging, even though i have to consider i barely have played for a year, and i found myself searching frantically for health, but it is on the good side. I didn't explore much on the first run, and found only 4 on the second try, unfortunately, which made me more curious about the rest. It hits the right spots on exploration, and the secrets, those i found at least, are well executed, except maybe one, that i think requires rocket jumping in an already quite harsh spot, and another that i don't get how i managed to open it. On layout is good and in some parts it works very well more for the combats than for looks and the traps add an extra good spice to it, even more in the big room. On the other side, is a bit cramped and hard to navigate in some parts. Brushwork is a bit random: sometime overboard on the rockwork, too much as on many parts it would look better with less faces, and on others is good, even if a bit simple in composition. Some texturing meed some fixing but it's OK, nothing infuriating here. combats are all enjoyable, but i would put some more health packs for skill 0 and 1, as its very common to be below 50 most of the time. *Mankrip: that's strange, it should open a door between the lights going back and the bars going down. Did you maybe nocliped before? That could activate a trigger chain in a bad way. It's the only thing i can think of. And thank you, Orl and Cocerello, for uploading the demo runs. They were entertaining to watch and provided me with valuable input on how new players interact with the map. @mankrip: Yeah, I know which water exit you're talking about. I had thought about making it easier to get ashore, but I think I remember some of the original id maps having some shores that were also hard to get to, but after years of playing the maps, you've just developed a "muscle memory" on knowing where to always climb ashore, without even really thinking about it. Same goes for my map. I had learned that the best way to get up from the water was from the left side, so during subsequent play-tests I just automatically, out of muscle memory, got off from the left. I thought the occasional tough water exit is kinda part of the "vanilla" Quake experience, so I just left the difficult exit there. I was really rooting for you guys to find the secrets while watching the demos! It felt like watching a player getting close to scoring at a game of football (or whichever game of your choice) when I saw you guys getting close to cracking a secret. I think the most satisfying "goal" to see Orl score on his demo was the one with the grenade launcher; I was screaming "GOOOOOAL" inside! :D I was worried I had made the secret too difficult, but as long as at least some people discover it, I'm happy. The secret area can actually be entered by rocket/grenade jumping regardless; the switch triggered with the grenade launcher just makes the entrance visible and accessible without rocket jumping. Cocerello was onto something in his run, seeing something weird there and shooting at the entrance. There were also times of great disappointment in the demos, as though the football (or whichever) player had just barely missed his goal. One such case was with a secret that was inspired by a secret in E3M4, but with a little twist. Orl had shot one of the required triggers to unlock the secret. He had even shot the other correct trigger several times, but unfortunately his approach was incorrect. Cocerello had the right idea, but he wasn't trying the right one. Anyway, seeing you guys miss the secret, Orl very narrowly, made me wail out of disappointment inside, not so much for you not cracking the secret, but for me not giving enough clues to help pinpoint the correct triggers. Come to think of it, I never was quite happy with that and a couple of other secrets. They require too much of a "brute force" kind of approach in order to find them, kind of like finding some of the more random push wall secrets in Wolf3d. Maybe not that level of obscureness, but you get the point. Some cool designs in this that show a lot of potential. I liked the starting area and the SNG secret. Some of the interior halls were cool too although a bit long. The coloured lighting was OTT in places but that's easy to tone down. I never got the GK, so skipped half the map with the SK. The SK trap was extra-annoying. The final combat was good tho, hard but okay as a finish. Yeah, watching demos with lots of secrets has that effect and keeps one all thrilled. In my case i had a similar experience on mapjam2, as i made the map quite branching for Quake standards. On the other side, your comments about the demos made me want to try it again, so here you have, my first (you already saw this one), third and fourth attempts. No second one, sorry but that has only me finding by chance the way to the Quad. This time i got to 8 secrets but couldn't fathom were the rest could be. If i were to add to my comments, i retire my comment for it being too much detailed on rockwork, for those overwater caves and after the ''boxes'' on the right side of the area after the gold key door. I love those caves, even though i do think that the ample one could get a bit better navigation and lighting. On the other side, there is several places were lighting is an issue, even though i played on a pitch black room and raised the gamma, like the jails, the aforementioned cave or the way to the lone zombie, and the secrets rewards are mostly unneeded for the player that finds at least half the secrets. And, to be honest, one of the secrets wasn't really that hard. ;) Looking at your demo runs, I noticed that the thing RELATED to the secret kept stealing your attention (and ammo) that it distracted you from looking at the whole picture. I'm not sure if I recall your view ever actually centering at the thing that really mattered, because of the distraction. I loved watching your actions when you were inside one certain secret, how you instinctively switched to the SNG in anticipation of the obvious showdown, but first thoroughly snooped the place for possible visual clues about how the encounter might play out, and yes, visual clues ARE there. Seeing your runs were quite educative, because when I saw you enter the final battle room with the Ring of Shadows and that one Scrag wouldn't wake up because of it, I realized that I had made quite an oversight. Seeing you struggle to get to the gold key finally made me realize probably the biggest mistake I had made on the map: the way to get to the key is too specific and requires too accurate timing. Even if players had figured out the secret but had failed to get there because of the secret being too darn particular, they very well might have given up on it, thinking that they'd need to reach it through another way or then just not seeing it worth the trouble. I think that's the thing I regret most about the map. I think i know where the easy secret is, as there is a highly suspicious place that had me wondering. Excuse me to get your hopes up, but i said that to avoid spoiling others on how to get to the Quad, but i used the regular high places approach, that's why i shot the door without hesitation on the third run, as i knew where it was from the second attempt. Unfortunately, the one that found that door first was one of the ogres' grenades, not me, so its more like 7/10 secrets found than 8. Tried to download Orl's demos but the link doesn’t seem to be working: it's sending me a timed_out error message. Thank You for your maps Esrael. I love the old school vibe! Thumbs Up. I have been working on a new map, actually. I just haven't been able to work on it since around mid-July, due to a fire in my apartment. Things have slowly been getting back to normal since then, however, so I might have time and energy to start working on the map again. This time I'll probably post some WIP versions of the map, as negke suggested, on this board to help me find bad design choices that I've become blind to. - A few minor texture corrections. - Fixed a teleporter in deathmatch so players won't get stuck in the pentagram room. - Removed unnecessary functions from entities to make the map compatible with Omicron bots. - A slight relocation of two entities, to prevent them from falling off the level. So what you might want to do is play on a lower resolution (maybe on windowed mode to keep the HUD nice and crisp), decrease texture quality to -2 or lower in DP settings, turn off normal maps or turn off high-res textures altogether etcetera. You won't find many DP/rtlights users around here. I, for one, thank you very much. Will you eventually do the same with your other maps? Just tested the map in FTE and noticed, that FTE treats rtlights differently compared to DP. Let's take coronas, for example, which I had tweaked carefully for DP, such as the ceiling window in the final arena. In DP the corona is subtle and nice whereas in FTE it's a blue splotch. So if you want to experience the rtlights as intended, you'll have to play on DP, unfortunately. ;C It's a shame, because FTE seems to run much more responsively in low framerates, whereas DP just feels sluggish. The temple room actually feels enjoyable to play in FTE, even with 40-50 FPS. If it starts to look like that I have to make rtlights separately for FTE and DP, chances of me making them for the rest of my maps are lowering. Or then I might just have to make a choice and decide for which engine I optimize the rtlights. Depends on in which the end result looks the best, I guess. Can you dump some links or info on where to learn how to create RT lights? for these engines? It wasn't actually until Tribal mentioned it in #19 that I learned that FTE also supports rtlights, so I only have experience with Dark Places. 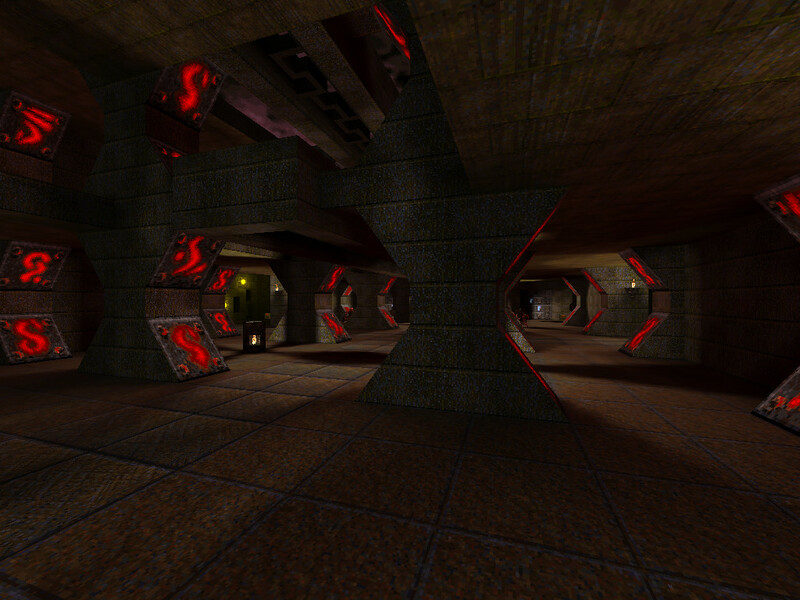 When I opened Temple of Quake for the first time, some lights were super bright and especially colored lights were extremely saturated. I believe the problem occurs if you use bytes [0-255] instead of floats [0-1] in the field values. For example, my map has quite a few fully red lights, so their [_color] keys have a value of [255 0 0]. Since DP seems to understand only floats, it interpreted the lights as 255 times as bright as a red light with a _color value of [1 0 0]. So don't be surprised if you're faced with overwhelmingly bright lights when you first fire up your map. Also, worldspawn sunlights aren't imported since there is no actual point light entity for DP to read. I made my sunlights by making weak ambient rtlights with very long radii. If your map has surface lights (featured in ericw-tools), only the one light entity that defines the surface lights will be imported; you'll have to create the rest of the surface lights individually for each of the desired surfaces. For the longest time I had no idea where the realtime lighting was stored, until I finally found it. However, I just tested saving an rtlights file while editing some random map, and this time the rtlights file was created in the same folder where the map was located (id1/maps), so if you can't find your rtlights file, look from those two places. - You can create lightstyles (flickering/pulsing lights etc.) like you would on a normal level editor when creating/modifying rtlights, but you can't create switchable lights from scratch. You can only modify existing switchable lights. If the light is turned off at the start of the map, you'll have to trigger the light first if you want to see what the rtlight will look like when turned on. He even has a bunch of very recent Twitch streams where he does rtlights live, so seems like there's not a shortage of material! I have no prior experience with it, but you're supposed to install the in-game map editor in the "updates+packages" menu and then type "ca_show 1" on the console. I just tried it for a little bit, and it seems fairly intuitive and helpful. With the commands I was able to improve my FPS at one of the slowest parts of the map by over 90 % from around 35 FPS to about 67 FPS! Furthermore, if I disable offsetmapping altogether (with the command r_glsl_offsetmapping 0), my FPS increases to 101 FPS, but that drop in visual quality already shows. So with the two first commands I could reach the sweet spot with good performance without noticeably sacrificing visual quality. Thank you for the playthrough and greatly positive feedback; nice to see this map still getting some love and people enjoying it as greatly as you did. <3 It's also nice that the rtlights I've made got put to some good use. Too bad the coronas are what they are in FTE. I think I just might want to make a version with rtlights optimized for FTE, as well. Good job finding (most of) the secrets, especially considering some of them are quiiiiite obscure. @~@ The one secret that you missed is arguably less obscure, with a fairly visible cue going for it. Reaching the secret, on the other hand, may not be very obvious. It was interesting to see how you used grenade jumping to get to the GK secret; that was a first! :D I really should've made the platform easier to get onto in this version, though. :/ I guess I was just kind of bent on keeping the update free of changes that affect gameplay, even if it would've been a very good idea to make some tweaks. You had the right idea for how to reach the Quad on top of the crypt, using the tombstones. In my own limited FTE testing I've noticed that it's harder, if not impossible, to reach it by jumping. It's probably got something to do with FTE using Quakeworld physics instead of the original Netquake physics. To enable the NQ physics type the command sv_nqplayerphysics 1 on the FTE console. Maybe that would allow you to reach the Quad via the tombstones. o: (Can't test right now, though, since I'm not at my desktop.) Another alternative would be for me to tweak the tombstone to be just a little bit taller to make the jump easier/possible. - Fix rtlights for FTE. - Heighten the tombstone close to the crypt. - Tweak the secret GK room lift to make it easier to climb onto. - Fix the lift to the zombie prison so knights won't block it from lowering.